Airplanes engage all my senses. Visually, airplanes are to me some of humankind’s most attractive, inspiring creations. Aurally, which of us is not moved by the sounds of a whirlin’ Merlin and its prop as a carefully preserved Spitfire screams by? Or the harmonious rumble of four big radial engines when a B-17 flies over? Which of us doesn’t run a hand gently and respectfully over an old Cub’s yellow fabric, or sit in the cockpit after a flight and touch all the controls before stepping out? And finally, there is the unique smell of a well-maintained old airplane. No, not the “barn finds,” with their musty, mouse-smelling interiors, or the ancient Cherokee 140s sitting out in the tall grass, their windows yellowed and dull, their upholstery dry and cracking. I’m thinking of a well-kept oldie, with an interior redolent of a mixed aroma made up of avgas, oil, pilot sweat, and some things I don’t understand. That aroma became familiar when I was a kid on Sunday tire-kicking expeditions to the airport with the family. I swear, sometimes I can even taste something when seated in an old bird. Now, many decades later, of all the sensory pleasures afforded me by being around old airplanes, the number one is their evocative aroma. I’ve hung around several EAA chapters over the years, and found, as is generally true now, that old airplanes seem especially attractive to old guys and a few seasoned gals. Perhaps I’ve missed an opportunity by not surveying them about how airplanes affect them through their senses. I suspect many would bring up some variation on my first paragraph— that the attraction of airplanes began in youth and that sensory memories are still vivid. I wonder if old aircraft mechanics have similar feelings about the sensory aspects of airplanes. I also wonder if younger pilots are acquiring any deep sensory affections for airplanes— young readers, speak up. New airplanes tend to smell to me a bit like new cars— especially high-zoot aircraft like the Cirrus— but I imagine… hope… that they soon acquire that heady, blended old airplane aroma, and that it’s strong enough to drown out the odors of expensive men’s and women’s perfumes and classy leather luggage! Are old guys attracted to old airplanes by nostalgia? For sure, in the first 30 years or so after WWII, there were lots of pilots whose romance with aviation began in the excitement of Lindbergh’s Atlantic crossing, grew through the “Golden Age” of ‘30s air racing and record-setting, and perhaps matured as biplanes went to war. But the restorers and flyers of old airplanes today are connected at best to those old days through their fathers or grandfathers, not direct experience. Is this nostalgia by proxy? These airplanes are wonderful – but owning one is a little different than a classic. Then there is money. Why would a person of means sufficient to acquire, say, a nice Skylane or Bonanza instead spend that amount of money, or more, to restore a Waco biplane or a Stearman or a Globe Swift? Those old airplanes have far less capability and utility than a newer factory-built airplane, and probably greater safety (called to mind by actor Harrison Ford’s forced landing in his Ryan PT-22). Yet for some, the decision is clearcut and firm: old wins out over new. Just as for so many things in life, the motivations of those who love, fly, restore, and preserve old airplanes are probably many and complex. For some, there may well be a kind of “nostalgia by proxy,” something that led me to buy an old fabric-covered taildragger similar to the ones my father trained in nearly 75 years ago. For others, it may be the seeming simplicity and straightforwardness of old-tech airframes, machines that ordinary mortals can understand, tear down, and restore. There might even be a little show business aspect— the ramp rats appear like magic when an itinerant old radial-engined airplane taxis up to the FBO, and many airmen enjoy being the center of attention. For others, an interest in history— WWI, WWII, the air-racing era, Lindbergh’s flight— leads to an interest in the old aircraft. But for the purposes of this essay, I’ll posit that the ineffable appeal of old airplanes to the five senses— sight, sound, aroma, touch, and even taste— forms an essential substrate that draws many of us to them. What about you, dear readers? Do old airplanes appeal to you in ways that new— or newer— ones do not? Please share your stories. Global attacks on general aviation: freedom in retreat? I certainly know what you mean by the airplane smell. Even the gliders I’ve flown have it to some extent, despite lacking the fluids a powered plane has. I love all airplanes for what they are. A brand new Cirrus or TTx is a work of aerodynamic art, a Cessna 195 is a beautiful sculpture, and an old warbird is history. I think it’s the story of each plane that intrigues me. I fly a 1974 172M and love sitting in it trying to imagine the adventures it and it’s pilots have had in 2300 hours of flying. The miles that have passed below it’s wings, the different runways and field that the tires have rolled on… Every machine has a story. My old airplane smells like Little Tree car air freshener. She’s a ’58 Tripacer, five years younger than me and a cousin to that pretty yellow Cub. I’ll admit that I’d like newer, shinier, faster but I’m on a Tripacer budget. But the more I fly her the more I appreciate her for what she is. My flying is strictly recreational and so it doesn’t matter all that much if it takes a bit longer to arrive at my destination. Eric, here’s an unusual boast: I bet my Aeronca Chief was slower than your Tripacer! I recall the day I mustered out of Uncle Sam’s Forces Of The Air. The lasted thing I did was to go on the flight line and sit in one of the airplanes just to drink in the aroma. Like smelling your sweetheart’s perfume one last time. Life goes on. I’ve only flown gliders so far but I agree with Chris 100%. The old wooden / tube and fabric ones have a distinct smell, the fiberglass ones are more subtle (maybe less pilot sweat?) but still noticable. Loving all planes: Yes! If its a DG 1000 with a L/D approaching infinity (or so it seems) or a sixty year old Ka 7 both put a smile on you face and you just cannot put ’em back in the hangar / trailer without an affectionate pat on the nose and a silent “Thanks for taking care of me”. Moving older gliders on the ground is a lot more involved. Carrying the tail is usually done by the pilot and I always felt in some sort of bubble, disconnected form everything but the aircraft, taking in the sights, sounds and smells of the airfield while going over the previous flight and mentaly preparing for the next. Great feeling, especially after the first solo with two more to go, because “the first one is luck, the second coincidence and the third one skill”. The crew is behind you, pushing and not saying a thing because they do not want to distract you, and you can see the winch cables being prepared for your next launch . 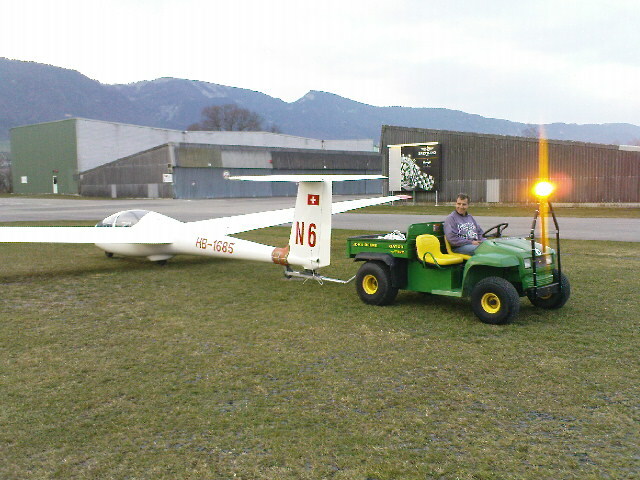 . .
And there you are, 14 years old with a glider older than your parents and wondering what else you will do with it in the future. I guess thats why 27y/o me loves that 60y/o aircraft . . .
Perhaps they’ve grown up in a family involved in the vintage airplane world or they’re drawn to it for other reasons but I can assure that there are lots of the younger generations that like old airplanes. For those who may not know, Brent Taylor leads the venerable Antique Airplane Association, which holds annually the nation’s greatest members-only fly-in of Antique and Classic aircraft, at their grass field near Blakesburg, Iowa. I was an AAA member until I sold my airplane and quit flying. AAA was founded by Brent’s father. I absolutely agree with Brent that lovers of old airplanes and the people who love them should at least once make the flight to Blakesburg (arrival by car is discouraged, I think; not sure about arrival on foot!). Sadly, my schedule and my old airplane’s never coincided to let me make that trip. Brent makes a point I hinted at in the article: one of the most powerful reasons people live loving airplanes is having grown up around them and being actively involved at an early age. I bet such lucky young folk indeed have lots of sensory memories associated with airplanes. Very well described Hunter, and reading other comments I can only affirm that among those five senses, also for me, the smell is most dear. I can easily recall the odor at the flying club where I got my license. The smell of the leather upholstery in my favorite Archer III. The scent of avgas remaining on your fingers for the rest of the day. The tinge of grease noticeable only very close to the instruments.The minor change in fragrance as the engine has delivered its full power for a couple of minutes. All unique and very precious. Gerhard, thanks for mentioning the smell of an engine that has just done hard work– that should have been included in the article as an important sensory memory of piloting light aircraft. Hunter: I kept the old seat upholstry (horsehair) from my 46 Stinson stowed away under the backseat of mny 46 Stinson for years just for the smell. It finally was in pieces. There is still a hint of it in the bowels of the cockpit. I remember the first smells of a Stinson at 5 years old and the feel of the controls. Now 60 years later I approach tube and fabric aircraft with my nose as well as my eyes and fingers. GREAT article!! Interesting timing, I just went to check on my 1946 J3 and dropped the window to grab something out of it and got a nice whiff and instantly gave me a smile! I even thought, man I love that smell! My J3 rolled off the assembly line on August 21st which happens to be my Birthday! She stills get her August annuals. And when it is above 0 as much flying as I can get to. I’m waaaay late to this party, but for years after I had stopped flying, when a “little” (especially older) plane would fly over, I’d look up, and I swear I could smell the interior (the oil, avgas, and everything associated), feel the vibrations and exhilaration, and even visualize the panel and view the pilot was no doubt scanning. Gosh, how I still miss my time “escaping the bonds of gravity”… and thank God for the opportunity. I advise younger folks to not get involved in aviation if they’re not willing to endure missing it when it’s over. It gets in your blood and captivates you like nothing else.